Flatside Pinnacle is one of my favorite places to catch a sunset. So, when my sister, who lives in Hot Springs, said she was having a bonfire on Saturday this past weekend, I knew which route I was taking to get there! 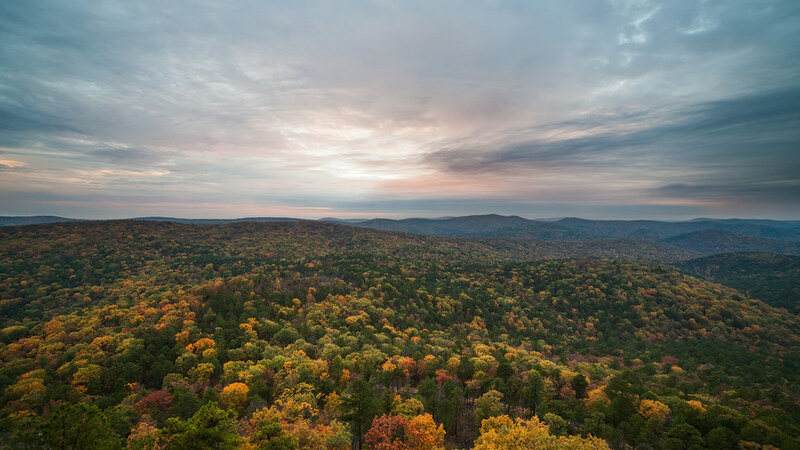 Flatside Pinnacle is only a short distance away out in the Ouachita Forest just west of Little Rock. Since it’s on the way to my sisters, we stopped to enjoy the sunset. Annie and I weren’t the only ones enjoying the view that evening, there were an astounding 6 other vehicles there when we arrived! I say astounding, because on every trip I’ve been on before this one, I’ve never seen another car parked at the trailhead let alone seen anyone else. Needless to say, I was quite surprised. Upon hiking to the summit we were passed by a couple with a handful of children. At the top there was only one other group there, so where did all the people go? I imagine they were hiking the Ouachita Trail which shares the trail that goes to Flatside. The sunset itself was fairly lackluster, but the view always makes up for it. The color of the trees were nearly peak fall color and the clouds were doing a great job to play with the light for this beautiful photograph captured from Flatside that evening. Afterwards, we hiked back to the base and continued on to my sisters, who had a great pot of chili and some delicious hot chocolate ready for our arrival.